Editor’s note: As Seattle’s six-story, 50,000 square-foot Bullitt Center prepares to open its doors this month, with the aim of becoming the world’s first commercial Living Building, we asked Bullitt Foundation president Dennis Hayes to explain the vision behind this historic project. This piece first ran in the Seattle Daily Journal of Commerce. Sometimes, incremental innovations can’t produce quantum change. You can tinker with carbon paper forever without producing a photocopier. The quill pen did not lead to a typewriter, and not a single typewriter company evolved to personal computers. The built environment demands a quantum change. Our cities were designed for an era that is vanishing. Energy was cheap and abundant. Water shortages could be solved with money and good engineering. The human population was comparatively small and rural. Two-ton vehicles were thought to be the most convenient way to transport 150-pound primates. And human impacts on the environment were local and mostly transitory. None of those conditions will be true in the cities of the future, where the vast majority of humankind will reside. There has been a lot of incremental improvement in buildings over the last 20 years. However, there are only a handful of significant commercial structures anywhere in the world that reflect a serious effort to design for the conditions that are likely to prevail in 2050. In fact, many of the most heralded buildings by the most celebrated architects are beautiful sculptures that are becoming white elephants. We decided to try to design, build, and operate a building that makes a quantum leap. Our goal was not to be “less bad” but to be affirmatively restorative. The Bullitt Center under construction last year. Photo by John Stamets. The Bullitt Center will have roughly the same impact on its site as the Douglas fir forest that covered the land 150 years ago. We started with the extremely difficult goals of the Living Building Challenge green-building certification program. These included net-zero energy, net-zero water and use of locally sourced materials, nontoxic building materials and wood certified to meet Forest Stewardship Council standards. To this we added a durability requirement — a 250-year design life — and some specific features, such as an inviting glass-enclosed stairway. To discourage the use of cars, we chose a walkable, transit-friendly neighborhood, and we installed a bicycle garage and showers on every floor. The building was designed from the ground up to ensure that its components serve multiple purposes. Ultra-efficient 10-by-4-foot windows, for example, reduce electricity use by providing ample daylight. They have external shutters to reflect sunlight toward the ceiling to penetrate to the inner core. They open and close automatically to provide fresh air and modulate the temperature. The building’s computer “brain” analyzes data from the building’s “nervous system” to optimize internal conditions, much as your own skin does. Few Seattle residents believe that enough sun falls on rooftops here to meet all the annual needs of even a one-story building, much less a six-story building. The key to success is a deep investment in efficiency. 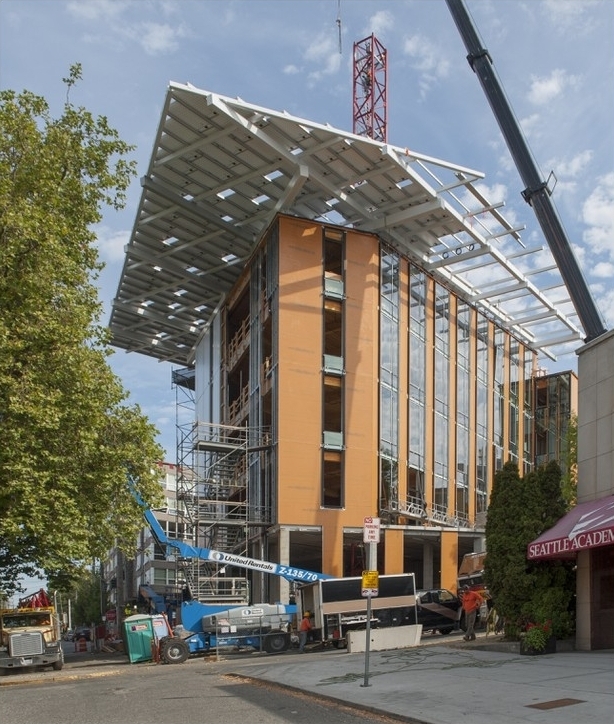 The Bullitt Center is designed to use half as much energy as a LEED platinum building. And on an annualized basis, this six-story structure will generate more energy from the sun on its rooftop than it consumes. So far, no six-story building has done this in Phoenix or Santa Fe, N.M., or anywhere else. We hope to achieve it in cloud-covered Seattle! I’m frequently asked why we decided to take this leap. There are several reasons. The Bullitt Foundation wants to transform the built environment in ways that are truly sustainable. Because that is our core mission, we need to walk our talk where we work. Second, there is still a lingering notion, rooted in images of geodesic domes, that super-green structures are uncomfortable and impractical. We wanted to build a super-green structure that is light-filled, with high ceilings, airy and comfortable. The Bullitt will increase productivity and decrease sick days. Hopefully, every employee of every tenant will see it as the best building he or she has ever worked in. Third, we always suspected that regulatory and financial obstacles would be at least as challenging as the technical barriers. As a not-for-profit institution we thought we might be able to blaze the trail through some of those difficulties more easily than, say, Donald Trump. If we could establish the proper precedents, it would be much easier for others to construct living buildings. Before we could hope to see living buildings spread rapidly around the world, we first needed to have a working example that people could touch and feel, measure and evaluate. In addition to being a working commercial building — with almost 90 percent of its space available to lease on the commercial market — the Bullitt Center will be an instrument of change. We will design educational materials and host conferences for bankers, appraisers, realtors, developers, public officials and others who influence the design of the world’s cities. Virtually everywhere, it is illegal to build a living building and impossible to finance one. We’ve overcome those challenges in Seattle, and we are eager to share the lessons we’ve learned. Dennis Hayes is the president and CEO of the Bullitt Foundation.